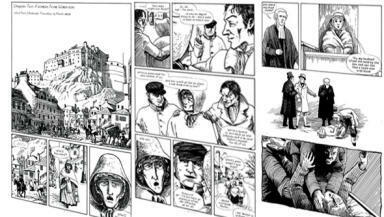 Edinburgh publisher prepares to retell an old tale using animation. The story of serial killers Burke and Hare is a notorious one which has been retold countless times over a period spanning more than 180 years. However, an Edinburgh publisher believes he may have found a new way of highlighting the pair's gruesome past. Writer Martin Conaghan and publisher Crawford Coutts have produced a comic book which tells the story of the pair's murderous year through a series of black and white drawings. The book features the tales of some of Burke and Hare's most famous killings, including the 1827 murder of a sick tenant who had been plied with whisky. Mr Conaghan said his aim was to present a new side to an old story. He said: "The primary focus for me starting out on this story was to break the enduring myth of Burke and Hare. "Burke and Hare have always been interpreted as being 19th century grave robbers, and what I wanted to do was dispel that myth but do it in a different format from anything that had been done before. "The story of Burke and Hare's been told in film, on television, in plays, on the radio, in books, in literature and in newspapers. And I though it would be quite interesting to do something different and tell the story in a much more visual, kind of creepy fashion." The book is being published as work begins on a Hollywood film about the infamous killers. A talk and exhibition about the pair will also be held at Edinburgh's Central Library later this month.